If you’re a fan of the fantastic and the (almost) magical, then you’ll know that it’s getting harder and harder to get through a single day without being almost paralysed by the veritable flood of big announcements being unleashed upon the world. Gravity waves, TRAPPIST-1, Juno and it’s watchful eye on Jupiter. All just more science candy to rot our teeth with. But here’s a little secret. There’s no magic like old magic. Warning label: this post will contain references to talking lions and impossible cosmologies. The universe and all within is an impossible cornucopia of wonder. J.R.R. Tolkien once spoke of the wonders of the unexplored vista in fiction. The universe is still (and always will be) an unexplored vista, like some dark brooding mountain range; its fell winds filling a lost band of travellers with foreboding. The mountain ranges are the same in every fantasy novel I ever read: cruel, dark and vast. I would join the travellers on their journey; be they the Fellowship of the Ring, Atreyu and companions finding a way through the Nothing or the Pevensey children, seeking Aslan. I would see the same mountains or vistas they would see and wonder what was in them, watching the story unfold. Did you ever wonder what was beyond those mountains? Nameless lands and other unrecorded epic histories and struggles? Life? Death? Infinity? Cyborg armadillos? A back door out into some rat infested alley somewhere? I spent a lot of time beyond the borders of these imaginary lands, seeing them as some kind of dreamlike state attached by imaginary geography to the main tale. Like junk DNA they didn’t seem to play any kind of part in the story, yet they also provided it with further structure. Playing a very important role by simply hanging there, forever out of reach. In a sense the distant past is like this imaginary land, especially the very distant past and in particular those very very first moments. Maybe even the time before time. How far back can we go really? Like the resurrection of Aslan in “The Lion, the Witch and the Wardrobe, in which the Lord of Narnia drew power from a time before time, is everything built on something else? Life is such a thing. Contemporary scientific dogma explains life as a phenomenon emerging from inanimate disorder. To the scientific mind this makes intuitive sense: a bit of stuff and another bit of stuff merged or were bonded chemically and some miraculous act of transmutation took place. Life appeared: self replicating systems, handing down and reliant upon the seamless transmission of information/instructions. Hiccups in this basic routine were bound to happen of course. If biological information transmission were completely flawless I wouldn’t be sitting here in a McDonald’s writing this, I’d still be a blob of stuff flopping around in some warm little pond somewhere. Obviously I’ve used the simplest description possible. Life changes in response to environmental changes and pressures, but I’m not going to have a blog post blowout by hyperlinking into a discussion about evolution. I’m thinking now about this process of emergence. Life itself is (at the very least) an emergent property, arising somewhere from within the girders and tangled architecture of Nature. Is it created by this chemical and physical architecture, or was the promise of life already hiding in the basement somewhere? A snapshot of the cosmic microwave background radiation. The ultimate family snapshot: everyone’s in it! This emergence is a built in property of the universe. Quantum theory holds that our perception of the universe calls it into existence. If this is true, then what of a time before life or perception even existed? Did the universe even exist before we came along? “We” being life that is. We of course aren’t the first things to experience the universe. Even a jellyfish experiences existence in it’s own way. I must make here a distinction between perception and intelligent perception. Obviously the universe existed before us. Take whatever side of the fence you like: religion or science. We can all explain the universe and we are all intrinsically aware that the universe was created and was here long before the first living thing flopped out of the primordial mud. This emergence of life was always meant to happen. The universe cycles itself, refreshing every second, every single passing of whatever fundamental subunit of time ticks by. We perceive it into existence, but it was perceived by things before us, things before them and so on. But what of the first thing? What perceived the universe before anything even knew it was there? The universe has always contained the framework for perception. Patterns in inanimate nature repeat themselves in biology. When I was at university I gave some thought to the emergence of multicellular life. After completing my degree I kept studying, doing an Honours year. I originally wanted to study biofilms. Of course the project mutated and became unrecognisable. My supervisor steered me towards something completely different, but I always thought about the emergence of something fundamentally different to single celled life. I felt that simplistic biological structures like biofilms represented a step in the transition from single celled existence to colonial organisms and from there to multicellularity. Take a wild guess what got me thinking about multi celled organisms emerging like this; ready made as it were. I was in one of the University cafés, up on the hill behind the sciences building. As did many others I spent a lot of time here studying, reading or just thinking. It was quiet and I had actually been thinking about multicellularity on this day when I looked down at my coffee. I have a tendency to forget things when I’m pondering the world and my coffee had gone cold. The wrinkly skin that had formed on top got me thinking. I remember drawing it, doodling it on a corner of a notebook page, recognising something. It looked exactly like all kinds of biological structures, in particular biological infrastructure such as a circulatory network. The branching structure or pattern we see here is so familiar to us we don’t even think about it. And so it began. I got thinking..
We see so many repeating patterns and structures in the natural world that they are almost white noise. The forking of tree branches or blood vessels, the winding of streams and rivers and the somehow disciplined swirling of clouds are very familiar to us all. It’s interesting how the same kinds of patterns appear both spontaneously, as in the case of rivers, or under the guidance of carefully meted out biological information (tree branches etc). Physarum polycephalum, a bizarre and fascinating oddity. This video summarised some of the points of this post really well. Enjoy the heck out of it. Via Biographic. A river winds through a muddy delta plain, stretching toward the brackish waters of an estuary. A stagnant shallow pond, at Mutton Cove Conservation Reserve, Port Adelaide. The branching pattern running through the midst of this mat is quite reminiscent of a river system. In fact, you’ve most likely figured out that these are both the same image. This is why I’ve used this image. It represents a key point I’m trying to make. The mat is likely mostly microbial, or composed of biological material: microorganisms, waste products, in addition to inorganic muds or silt. The branching and bifurcations within the mud are most likely formed due to abiotic factors, in the same way that synaerisis cracks form in muddy lake bottoms as the last of their water dries. My question: could such structures; formed by innocuous natural processes, provide templates for biological processes? Biofilms are known to possess channels and a certain level of internal structure. Some of these structures are similar both in form and function to structures that perform analogous tasks in multicellular organisms. Did early multicellular life get an organisational leg up from a deeply mathematical universe, in which all manner of patterns appear in a multitude of environments? I say the universe is deeply mathematical, but I will admit here and now I am no mathematician. It’s just always seemed apparent that the universe operates around a very secretive and mysterious set of guidelines. In the same way that a businessman from Sydney can walk into a McDonald’s in New Delhi and expect exactly the same Big Mac he’d get in Moscow, so it follows that rivers of liquid hydrocarbons on Titan form branching channels and patterns; following the same recipe as rivers of water on Earth. What I mean is that some things just never change, wherever you may be in the local Universe. If you were standing on an exoplanet passably similar to Earth you’d see flows and channels just like those on Earth. One of the planets orbiting TRAPPIST-1 may make a good setting for this imaginary walk. The sky is dark. It’s like a permanent sunset: a red hue washes over a rocky landscape. You’re standing on a low cliff, looking down at a river. 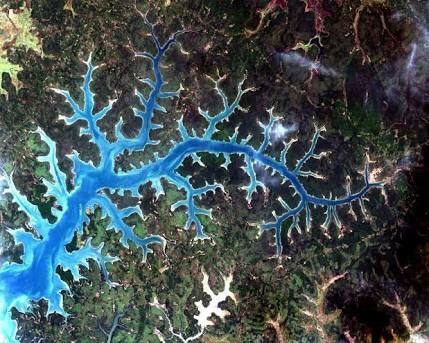 It looks like any river on earth. OR, just like the river systems on Titan. This similarity is spontaneous. That’s something we all intuitively know. This is what I’m getting at. If life formed spontaneously as a result of natural laws, then life- and more complex life would arise on other worlds. Depending on its environments and circumstances it will obviously be different to life on earth, but there will also be similarities. It’s all about infrastructure. Infrastructure arises unbidden in all manner of systems. A flock of starlings is a system. Spaghetti on toast is not. A system is a collective of interconnected parts or processes, all acting within the context of a greater whole. A flock of starlings differs from spaghetti on toast in this fundamental aspect. The flock appears chaotic, but in fact behaves according to rules which are seemingly set in stone. The spaghetti shows no flavour of interconnectedness nor any kind of behaviour. The strands do not interact and so are unable to work together to prevent being eaten by me. The flock of starlings however can. The swarming behaviour exhibited by the birds and other creatures which swarm (locusts, Monarch butterflies etc) is an emergent property, arising from the interactions between sub units. Back to infrastructure. The flock of starlings acts as it does because all of the birds can see each other or otherwise interact with each other in some way. Mechanisms exist by which the birds connect to each other, and so something new emerges from a seemingly disparate collection of birds. Consider a city. Many cities began as gatherings of family groups or tribes. For these small groups such an existence worked. Not much infrastructure other than language, common customs and some simple rules were needed in order for these simple societies to function. 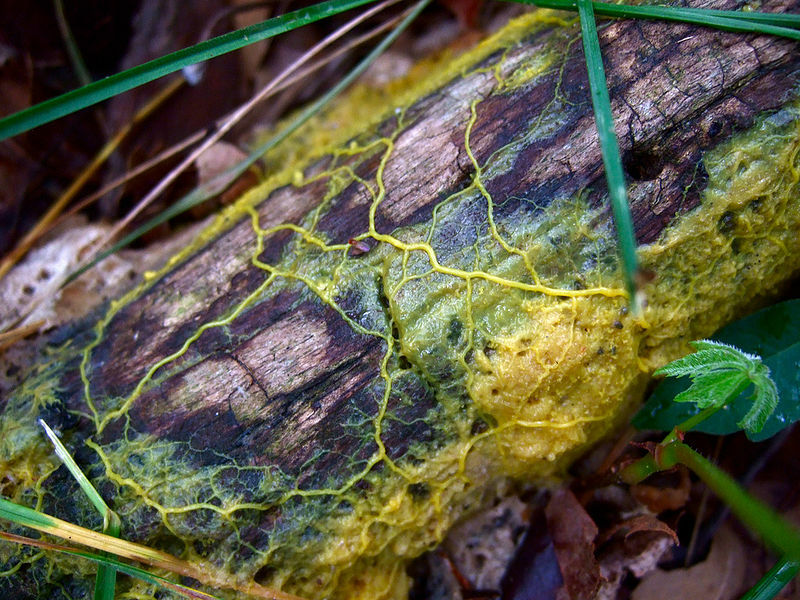 This is the famous example of a slime mold set to work redesigning Tokyo’s rail network! Many experiment have shown these unbelievable organisms effortlessly redesigning Spanish and Portuguese rail networks: often rendering them more efficient than the human engineers! So at a glance at least it looks as though the collective behaviour shown by a slime mold runs along similar lines to the growth of a city. Lines of infrastructure, connecting sub units, create a gestalt entity; something more than the sum of its parts. If life (and in particular multicellular life) arose due to a proclivity for exploiting the connective properties of certain naturally recurring patterns and structures, how did life figure this out? Obviously roads didn’t appear before cities. But in every single city on earth roads could be found. The idea of a road always existed. Roads were inevitable. Off on a wild tangent? Is this a flight of fancy? Maybe, maybe not. What do you think? Self organisation and emergence aren’t just products of group behaviour. They are inherent tendencies, built into the fabric of space and time. Feel free to pipe in with your opinion. Thanks for reading. It’s been a long post, and possibly rambling, but it’s a blog. Not the six o’clock news. Check out Biographic on YouTube and Twitter. Well worth it.